What could be causing this error? I am following the Teiid Designer User Guide and have completed all pre-reqs. For Teiid VDB version use like 1 not "1.0.0". This canonical version support was provided in 10.x versions of Teiid but Designer support still needs to catch up to that. however, I am still getting the same error. Can you delete the previous VDB and create a new one? Or it looks like it is not updated. I had to use the shutdown command to shutdown my Wildfly server and restarted it in standalone mode. 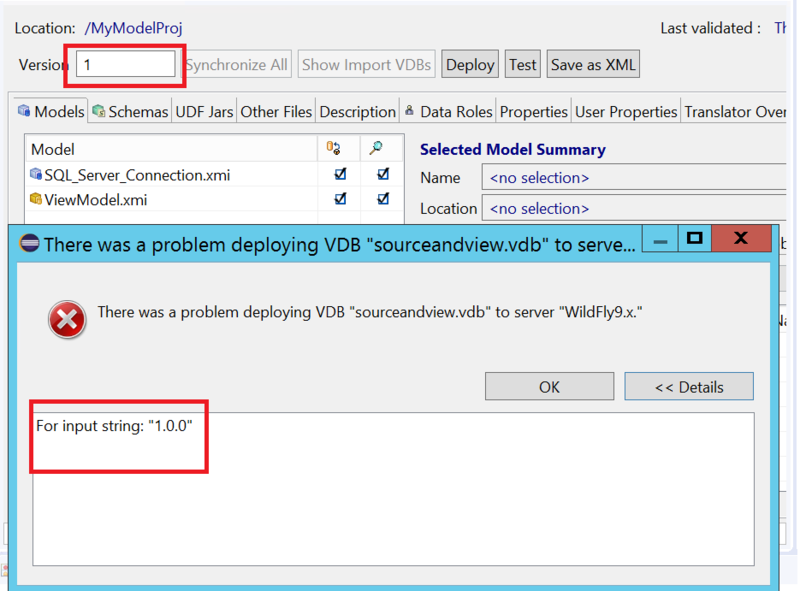 preview vdb files are temporary files, I was talking about deleting the VDB in Designer. Also, you are not required to restart the server either. Can you tell us exact version of Designer you are using? Shiloh can you verify in the Teiid Instance server tab (server editor page) that the Teiid version of 9.0.x was discovered correctly? When I was getting the error, the Administration Connection would be successful but the JDBC Connection would never work. Once I changed the version number in PREVIEW xmls (in back end), I could make the JDBC connection. Can I report this as a bug in Teiid Designer?